It could’ve been the way that I angled my hands. It could’ve been the way that I positioned my body. 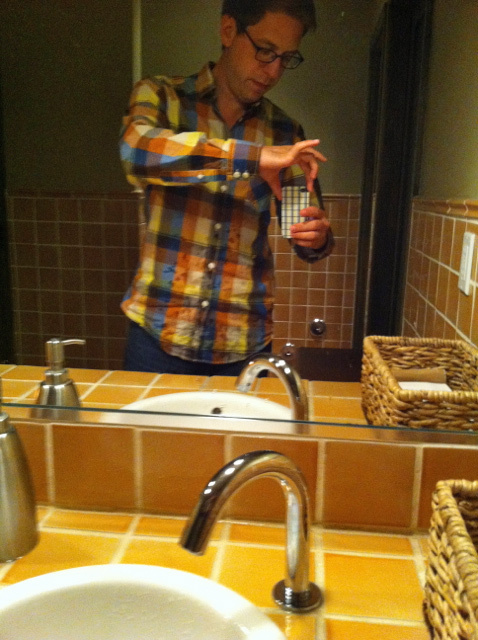 But last night at Fig & Olive on Melrose, out celebrating Craig’s cousin Katie’s birthday, I positively drenched myself while washing my hands in the bathroom. And, truth be told, I pretty much blame the sink. If there were a Zapruder tape of the incident, you might see the water ricochet off my hands into the sink bowl where it then splashes upwards, either from the bottom lip (the most likely scenario) or the lip closer to the mirror, dousing me in a wave of water not dissimilar from the one Shamu produces at Sea World. Then you’d see me patting myself frantically with paper towels. Then you’d see me walking back to the table, past models and actors all staring at my water-splattered shirt. Has this ever happened to you? It’s happened to me before. Restaurant bathroom sinks can be many things: they can be made of marble, they can be made of glass. Maybe you have to turn on the faucet yourself, maybe it has an automatic sensor. None of this matters, though, if the bowl of the sink is angled so it splashes water on customers. Even if your restaurant is famous for its wet t-shirt contest, like something you’d find in Ft. Lauderdale, it’s still a no-no. Which is why, last night, when I went a second time to the bathroom, I kept a large distance between myself and the sink as I washed my hands. Splash me once, shame on you; splash me twice, and I’m bringing a bottle of Purell next time I go.